Johnathan Thurston has three games remaining in his NRL career. JOHNATHAN Thurston admits he's growing tired of an NRL farewell tour that still has three games remaining. Saturday's clash with Cronulla will mark the North Queensland playmaker's final game in Sydney, with his Cowboys currently last on the ladder. Next week will be his Townsville swansong, before he officially signs off on the Gold Coast in what could be a battle for the wooden spoon against the Titans. While the idea of having the last laugh over long-time foe Paul Gallen appeals, the 35-year-old admitted his retirement sideshow had started to drag. "It's a little bit tiring; I'm sure you guys (the media) are all getting sick of talking about it too," Thurston, who made his NRL debut in 2002, said on Tuesday. "There's few games to go, hopefully we cause a couple of upsets … it's been a lot more enjoyable when you're on the right side of the scoreboard." Johnathan Thurston will officially retire in three weeks’ time. Long-time teammate Gavin Cooper likened Thurston's farewell to NBA legend Kobe Bryant's final season at the Los Angeles Lakers two years ago. "We're getting farewell movies everywhere we go," he laughed. "The (New Zealand) Warriors are probably setting the standard with how they're sending off retirees, then obviously we have a long history with the Broncos and I'm sure Sydney will offer something too. "It's probably a fitting end in Sydney, finishing at Shark Park for Johno, given our history." That history includes a round one encounter this year when Cooper accused the Sharks of employing dirty tactics, while the teams have knocked each other out of four of the last five finals campaigns. 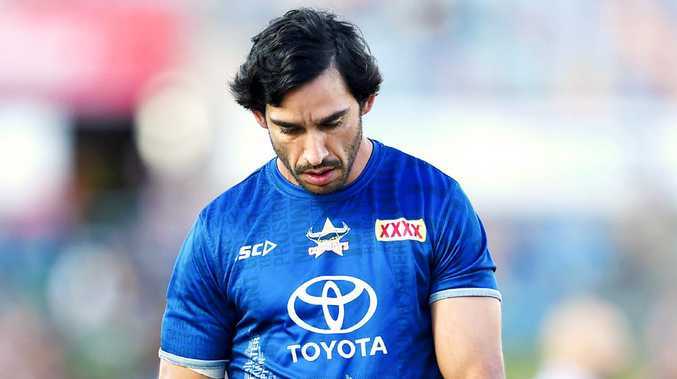 Thurston has also enjoyed a long period of State of Origin dominance over Sharks veteran Paul Gallen, who at 37 is yet to decide if he will join the Cowboys legend in retirement. "Yeah, there's a good rivalry between the two clubs; both have forward packs that like to come after each other and as a half you like to sit back and watch that," Thurston said. "It'd be nice to get one more over the Sharkies, but I know it's not going to be easy."